Why Penguin's feet do not freeze? Antarctica, as you might expect, gets pretty darn cold: temperatures as low as -40 °F are often recorded during the winter. For the creatures who live there, this extreme cold demands innovative survival strategies that enables very less heat loss. Scientists recently discovered that Emperor Penguins — one of Antarctica’s most celebrated species — employ a particularly unusual technique to keep themselves warm and dry in the extreme cold conditions. A man standing barefoot on ice would quickly get frostbitten, penguins can do so all their lives with no damage at all. These highly specialized marine birds are adapted to living at sea – some species spend as much as 75% of their lives at sea. Penguins are flightless birds, but are excellent swimmers. Penguins have webbed feet for powerful swimming. Their bodies are streamlined to reduce drag in water. Their short wedge shaped tail and flippers like wings help them swim underwater at speeds up to 15 mph. Penguins have counter shaded dark and white plumage (feathers). All adult penguins have dark backs and white or yellowish–white fronts. Their dark backs are usually black. However, their beaks, necks, and feet may be brightly colored. Some penguins also have colorful crests of plumage on their heads. The colors of the penguins help them blend in with their surroundings. A school of fish swimming above a penguin may not even notice the bird. That&apos;s because the penguin&apos;s dark back blends in with the dark waters below it. An enemy or prey may not see a penguin swimming above it either. That&apos;s because the penguin&apos;s pale belly blends with the bright light of the sky or ice above it. The Penguin feathers, also called as plumage, are waterproof. They keep penguins dry underneath, even while the birds are swimming. If penguins don&apos;t keep their plumage in very good shape, they don&apos;t stay waterproof. So penguins spend several hours a day preening, or caring for their plumage. Penguins use their beaks, flippers, and feet to preen. For extra protection in the water, penguins spread oil on their plumage. The oil comes from a special gland near their tail plumage. Penguins shed their plumage because they become worn and damaged. When penguins shed their old plumage and grow new ones, it is called molting. Penguins molt once a year. Penguins always molt on land or on ice. Until they grow new waterproof coats, they can&apos;t go back into the water. And the water is where they need to go to find food. Sometimes penguins might have to go for more than a month without food while they molt. To prepare, penguins eat as much as they can during the weeks leading up to the molt. Eating so much helps them add fat to their bodies. The penguins live off the fat while they grow new plumage. 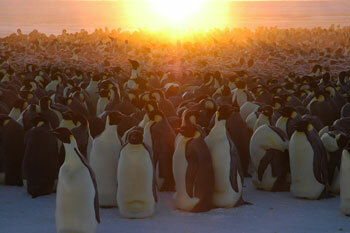 Penguins can warm up by basking At a colony on the frozen Sea, emperor parents and chicks bask in the brief summer sun. Penguins are warm blooded animals and they maintain internal body temperatures similar to warm blooded animals in any other climate zone – that is about 35–42 °C (95–107 °F). Tropical animals with more variable body temperatures such as reptiles and amphibians can warm up by basking in the sun if they cool down and they never cool down that much. A large (bigger than a small insect) Antarctic animal will never get enough energy from the surroundings to become active if it allows itself to cool, so they have to stay warm to be active. Warm blooded animals in cold climates are pretty large. Even the smallest Antarctic birds are on the large side and the smallest Antarctic penguin, the Rockhopper is 2.5kg. The Adelie and Emperor penguins of the deep south are larger still. 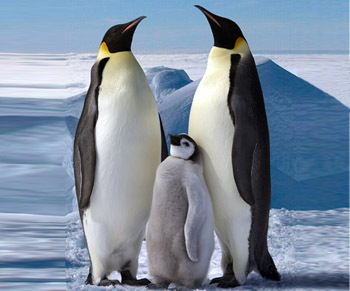 Adult weights are 5kg for the Adelie and 30kg for the Emperor – a similar size to an overweight 10 year old child, but with a man–sized chest measurement. The larger the animal, the smaller the surface-area volume ratio and hence a less relative area of its body is exposed. This helps the penguins to stay warm. How Penguins survive cold conditions? Penguins are endotherms, which means that they have the ability to keep their body temperature at constant levels even when the surrounding temperature is very different. To regulate the body temperature they need to prevent the heat loss to the surroundings and insulate themselves well. Penguins can minimize heat loss by keeping the outer surface of their plumage below the temperature of the surrounding air. 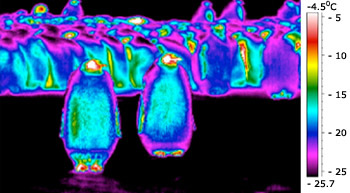 Scientists have discovered the unusual thermal properties of the penguin's plumage while studying the birds in their natural environment using infrared imaging. During their research period, the average air temperature was 0.32 °F. At the same time, the majority of the plumage covering the penguin&apos;s bodies was even colder: the surface of their warmest body part, their feet, was an average 1.76 °F, but the plumage on their heads, chests and backs were -1.84, -7.24 and -9.76 °F respectively. Overall, nearly the entire outer surface of the penguin&apos;s bodies was below freezing at all times, except for their eyes and beaks. By keeping their outer surface below air temperature, the birds might paradoxically be able to draw very slight amounts of heat from the air around them. The key to their trick is the difference between two different types of heat transfer: radiation and convection. The penguins do lose internal body heat to the surrounding air through thermal radiation, just as our bodies do on a cold day. Because their bodies (but not surface plumage) are warmer than the surrounding air, heat gradually radiates outward over time, moving from a warmer material to a colder one. To maintain body temperature while losing heat, penguins, like all warm-blooded animals, rely on the metabolism of food. The dark colored plumage of a penguin's dorsal (back) surface absorbs heat from the sun through radiation and help the penguins to warm up. Since their outer plumage is even colder than the air, they might gain back a little of this heat through thermal convection — the transfer of heat via the movement of a fluid (in this case, the air). Heat exchange by convection depends primarily on the temperature difference between the skin and the air and on air movement. As the cold Antarctic air cycles around their bodies, slightly warmer air comes into contact with the plumage and donates minute amounts of heat back to the penguins. Then cycles away at a slightly colder temperature. Heat conduction and convection in penguin Penguins can maintain homeostasis with its well designed body with a very thick coat of plumage and huddling in large groups to reduce surface area. 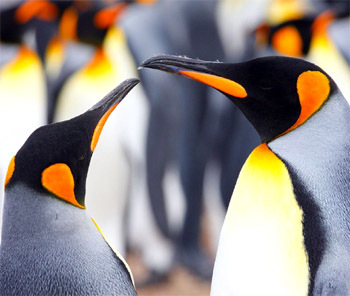 Plumage of penguins prevent the heat loss due to convection and help them to keep warm. Plumage work on land, but in the water where penguins spend quite a bit of their lives, they&apos;re not so valuable. On the land however, their plumage have a very valuable function in keeping them warm. Penguin plumage aren&apos;t like the large flat plumage that flying birds have. They are short with an under–layer of fine woolly down. Penguin plumage are also very good at shedding water when the bird emerges from the sea. They overlap and give a good streamlined effect in the water and excellent wind–shedding abilities when they are on the land. When the climate gets very cold, penguins can puff their plumage out to trap more air for even better insulation. When it gets too hot (like as high as freezing point even!) they fluff their plumage out even more so that the trapped warm air can escape and enable the penguin to cool down. Penguin on its toes In this position the heat loss due to conduction is minimized. The contribution that conduction makes to the heat loss depends on the thermal conductivity of the materials in immediate contact with the skin. This heat loss occurs when the body parts of penguins come in contact with the ice or snow which is at very low temperature. Ice and snow are cold. If we lie down on snow, we would be really cold as there would be a large area of contact to lose body heat through conduction. If we stand up, immediately our area of contact reduces enormously. If we stand on tip–toes, our area of contact is reduced to a minimum. This is what penguins do! They rock backwards on their heels, holding their toes up to reduce the area of contact with the snow, to prevent the loss of heat due to conduction. To stop themselves from falling over backwards while holding their toes up, they support themselves by their stiff tail plumage that have no blood flow and so lose no heat. So in the coldest conditions, penguins sit there supported on their heels with reduced blood flow, to keep themselves warm. What's so special about Penguin's feet that do not freeze? Penguins can control the rate of blood flow to the feet by varying the diameter of arterial vessels supplying the blood. In cold conditions the flow is reduced, when it is warm the flow increases. What really keeps penguins warm and provide insulation is a layer of fat under the skin called blubber. It helps the penguins in keeping warm especially when they are in water. This fat layer also serves as a valuable energy store that comes in handy when they go long periods without food. This fat layer is the best form of internal insulation devised by mother nature and therefore the best way to keep the Penguins warm. The extra layer of fat acts like a blanket to help keep the birds warm when the temperature drops. 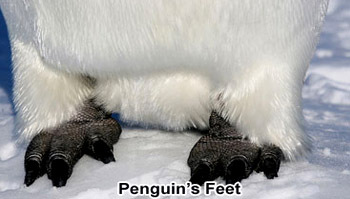 The feet of penguins pose particular problems since they cannot be covered with insulation in the form of plumage or blubber, yet have a big surface area, where they can lose a lot of heat due to conduction when they are in contact with the snow. But the feet of penguins never freeze even at very low temperatures. The system that stops a penguin&apos;s foot from freezing is very elaborate and sophisticated. It employs two mechanisms explained below. Counter current heat exchanger In penguin&apos;s leg Arteries supplying warm blood to the feet break up into many small vessels that are closely allied to similar numbers of venous vessels bringing cold blood back from the feet. Heat flows from the warm blood to the cold blood, so little of it is carried down the feet. The first mechanism allows the penguin to control the rate of blood flowing to its feet by varying the diameter of arterial vessels supplying the blood. In cold conditions the flow is reduced, when it is warm the flow increases. Humans also can do this too, which is why our hands and feet become white when we are cold and pink when warm. The second mechanism takes the form of counter current heat exchangers at the top of the legs. Generally in penguins, the warm blood entering tails, flippers or feet flows past cold blood returning to the rest of the body. This is called counter-current heat exchange. This arrangement warms the cold blood entering the rest of the body, and cools the blood entering the tail, flipper or foot. It reduces the overall loss of heat from the body. The arteries, which supply warm blood and oxygen to the penguin&apos;s feet break up into many small vessels which are closely linked to similar numbers of venous vessels bringing cold blood back from the feet. So, when heat is lost from the arterial vessels, the venous vessels running in the opposite direction pick it up and carry it back through the body, rather than out through the feet. This means that in the very remote regions of the skin, cells get oxygen but heat isn&apos;t lost through the skin. At low temperatures or when in the sea, the blood flow to feet is very low anyway and are held a degree or two above freezing so that the temperature difference between feet and the surface is minimum. Hence there is a minimum heat loss due to conduction avoiding frostbite. When it gets too cold, the feet are covered by the plumage and fat layer of the body so they are not exposed to cooling winds. When the penguin needs to lose heat quickly, the blood flow to these extremities is increased. So lots of warm blood enters them which cools quickly. Thus excess heat is dumped rapidly and efficiently. Huddling of penguins Huddling together helps them shield from the chilly winds that are so common in the Arctic region. The penguins increase their chances of survival by unique behavioral adaptation called huddling, that is grouping together or tugging. The huddling behavior is especially useful during storms. In these conditions temperatures can drop to −40°. When the penguins huddle, the density of penguins increases. Through the huddling behavior, the penguins reduce their energy loss to approximately half the energy loss of them standing in isolation. This is very useful, since at the breeding colonies, male penguins do not feed for about four months. In these huddles, the penguins move in a coordinated periodic wave. This allows every penguin a chance to move from the colder outer region of the huddle into the warmer inner region. As the penguins march together to find a breeding place, they tug themselves closer together during cold storms which help them to stay warm. Up to 6,000 male emperor penguins will huddle together while incubating their eggs during the middle of the Antarctic winter. Trapped air provides better Insulation Penguins have tufts on the shafts below the plumage which are helpful to trap the air for better insulation. 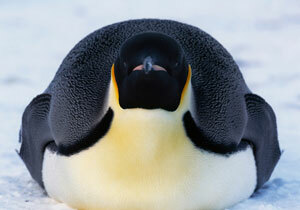 Improved insulation for the penguins is observed due to a fat layer. But it may not be sufficient on its own to maintain the stable temperature of the body when the penguins stay inside the sea for a long time. These penguins must remain active while in water to generate heat in the body. Penguins that live in cold climate regions usually have longer plumage and thicker fat than those that stay in warmer climates. Hence penguins in colder climatic regions have better insulation. 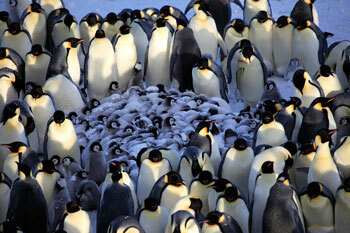 Penguin's plumage are densely packed and on overlap they make a surface which is almost impenetrable to wind or water. 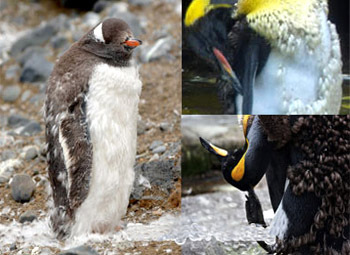 These plumage provide waterproofing in water that is critical for the survival of penguins in water. In general, the temperatures of Antarctic seas would be ranging from -2.2 °C to +2 °C. Penguins have tufts on the shafts below the plumage which are helpful to trap the air. This trapped air acts as an insulated layer that provides 80% to 84% of the thermal insulation for penguins. The layer of trapped air is compressed during dives and can dissipate after prolonged diving. Handling thermoregulation hurdles They are able to tip up their feet, and rest their entire weight on atripod of the heels and tail, to reduce the contact with the icy coolsurface and hence there will be a reduction in the heat loss. Penguins retain the heat by tucking in their flippers close to their bodies which help them to reduce the surface area for the heat loss. As we know that the dark colors absorb more heat than the light colors, penguin's dark skin which is black in color help them to absorb more heat from the sunlight. There are different types of penguins, out of which King and Emperor penguins are able to tip up their feet, and rest their entire weight on a tripod of the heels and tail, to reduce the contact with the icy cool surface. Hence there will be a reduction in the heat loss. Overheating can be a problem to penguins both in land and water. The penguins can cool down by moving to shaded areas and by panting (like dogs). Penguins can ruffle their plumage, this breaks up the insulating air layer next to the skin, so releasing the warm air and cooling them down. Penguins can increase their heat loss by holding the flippers away from the body. The circulatory system of penguins adjusts to conserve or release heat to keep the temperature constant. For Example: To conserve heat, blood flowing to the flippers and legs transfers its heat to blood that is leaving the flippers and legs. 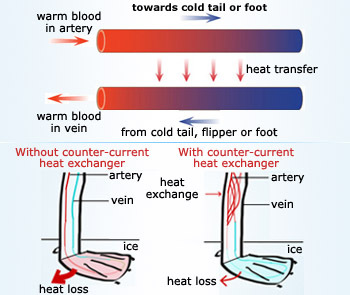 This kind of heat exchange is known as 'counter current heat exchange' (as explained earlier) which enables the heat to be maintained in the body rather than reaching the legs or flippers. If the body becomes too warm, blood vessels in the skin gets wider, bringing heat from within the body to the surface and hence it can be lost.